Not to say it is not busy, because my plate is overflowing at the moment, but amid the hustle and bustle beautiful things have been happening. First, I got to visit my best friend and her family in the UK where we had a lovely side trip to Wales. Second, my brother got married to a great girl and I got to make their cakes. Third, my Aunt Ruby is out of the hospital and I am going to see her in a few days. Finally, I am on the home stretch of my book with photos and edits. 15 pies in 6 days … it will be a challenge for sure!! Yes, I am very busy but it is all good. 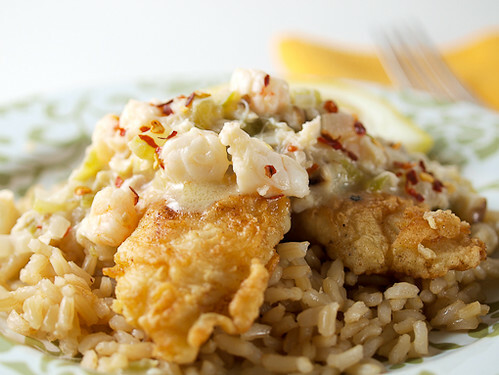 When things are good I like to celebrate with beautiful food, and nothing is more beautiful to me than perfectly cooked fish topped with a rich seafood sauce. 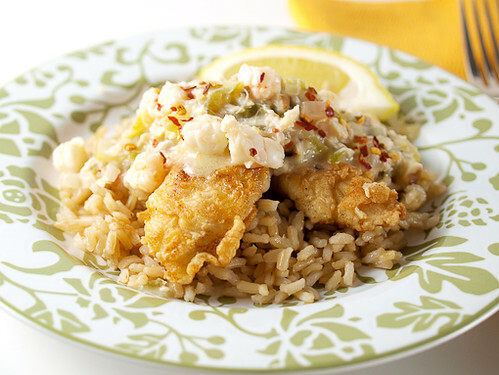 For those not in the know, Pontchartrain sauce is a delightful Cajun sauce loaded with seafood, tender vegetables and bold spices. 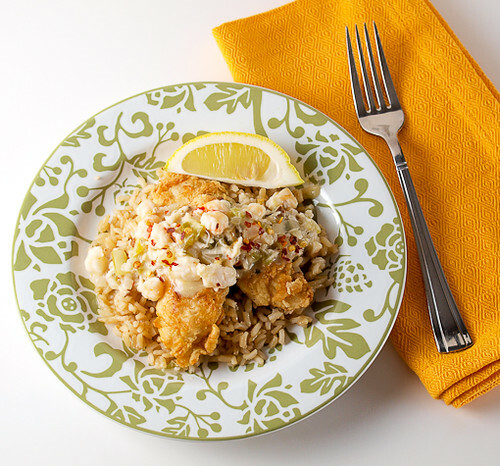 In this case I used some juicy chopped shrimp and lump crab meat and served it over some pan fried white fish, but you could also serve this sauce over pasta or rice and still have a complete meal. Heat the oven to 200F, or the lowest setting for keeping food warm. 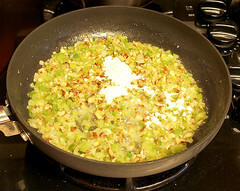 In a medium dish combine the flour, salt, and pepper until well blended. Pour the beaten egg into medium flat dish. 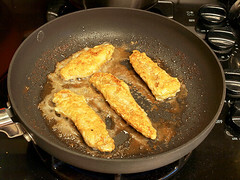 To bread the fish begin by dipping in flour, tapping off the excess. Dip the fish in the egg, allowing an excess to drip off, then coat again in the flour. 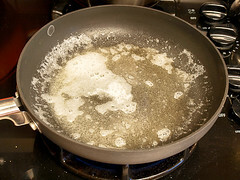 In a medium skillet over medium heat melt the butter with the oil until the butter foams. Add the fish and cook until golden brown on both sides and the fish reaches an internal temperature of 135 F. Transfer the fish to a baking sheet and keep warm in the oven while you prepare the sauce. 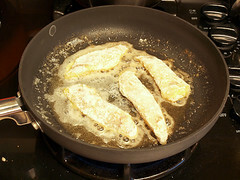 In the same pan you cooked the fish in over medium heat add the butter and melt until it foams. 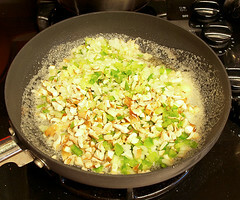 Once it foams add the mushrooms, bell pepper, celery, and onion and cook until they begin to soften, about five minutes. 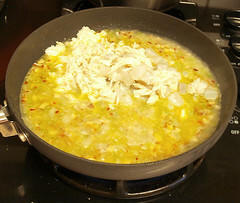 Add the garlic and cook for one minute more. Add the flour and red pepper and cook until no dry flour remains, about three minutes. Once the flour is cooked add the lemon juice, wine and chicken stock and cook, stirring well, until the sauce comes to a boil and thickens. Reduce by 1/3 then add the shrimp and crab. Reduce the heat to medium-low and cook until the shrimp are opaque, about four minutes. Stir in the cream and cook for one to two minutes more. 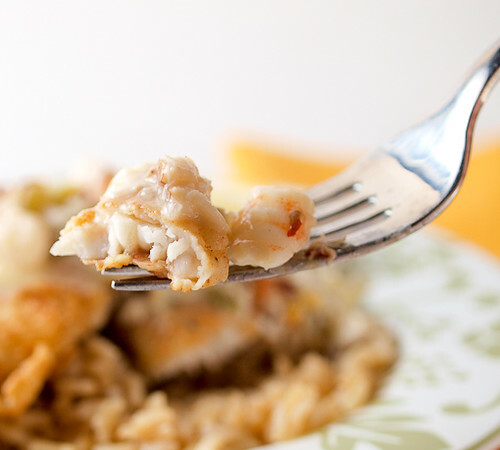 To serve plate the fish and spoon the sauce over the top.